Some people in the aromatherapy industry may express concern over regular daily use of essential oils, concerned that they are too potent. doTERRA Essential Oils are indeed very potent. One drop of Peppermint Essential Oil has the potency of about 28 cups of peppermint tea. doTERRA and its users usually find this belief to be unfounded, when oils are used safely. Although we know that more research remains to be done, the specific health benefits of regular essential oil use have already been well demonstrated, both clinically and anecdotally. Many scientific reviews and studies verify that appropriate doses of essential oils are safe and efficacious. I offer all of my team advice and information so they can make informed decisions, if you are already enroled with doTERRA ask the person who enrolled you, or the person who enrolled them if you have any questions, it's very important to have accurate information. Quality. The oils you use matter. As the world leader of essential oils, doTERRA strives to ensure that only the highest quality oil is bottled for distribution. This attention to quality does two things: One, in comparison to using only the pure oil, using altered essential oils dramatically increases the possibility of sensitivity or reactions, and decreases the effectiveness of the oil. And two, it means that a small does is sufficient. We will talk more about the appropriate dosage below. Dosage. 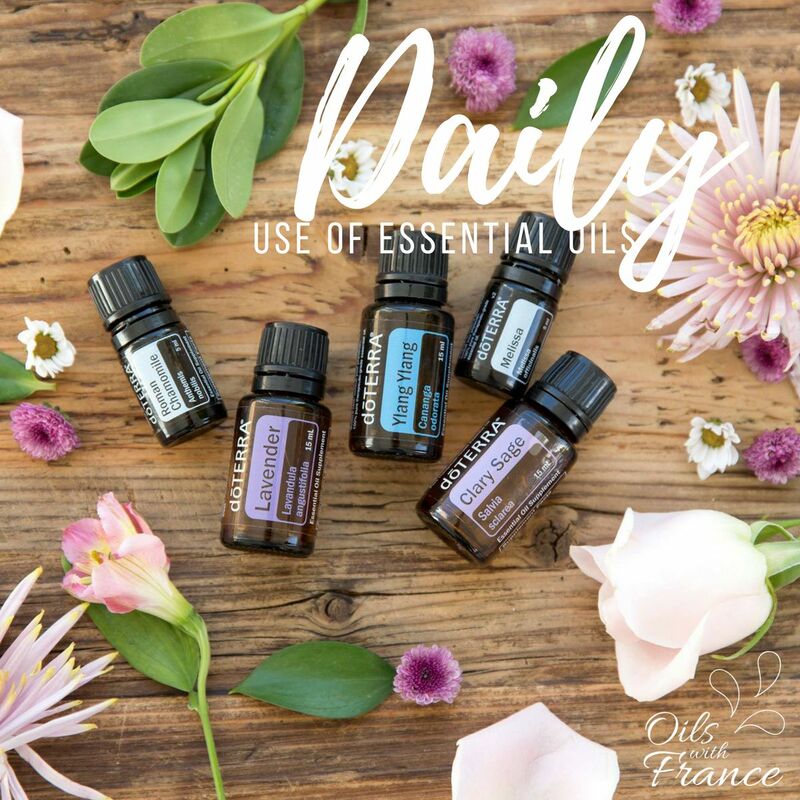 Just as you shouldn’t take more than the recommended dose of vitamins or minerals, essential oils are potent and a very small dose is more than sufficient. Whether used in a diffuser, on your skin, or in a Veggie Capsule, no more than a few drops are needed at a time. 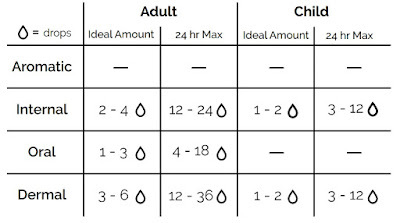 See the chart below for recommended dosage to see how it differs for adults and children. Internal use is when you use supplements, oral is when you put drops (Frankincense or Copaiba for instance) under your tongue or if you use any drops of oils in your tea, coffee, water or food. Variety. Take a look at the many ways to use individual essential oils, and you’ll see that many benefits are similar. However, changing up the oils you use rather than sticking to one or two can be beneficial, just like having variety in your diet. Another way trying new oils benefits you is you can find what oils work best with your body’s chemistry for the benefits you want. Dilution. Some oils are incredibly potent, like the phenols and aldehydes groups (eg: Cassia, Oregano, etc.). These are known as “hot oils” and should always be diluted. But, aside from these dilution is an excellent method to use with any oil to increase the surface area and slow down absorption to prevent any possible sensitivities. 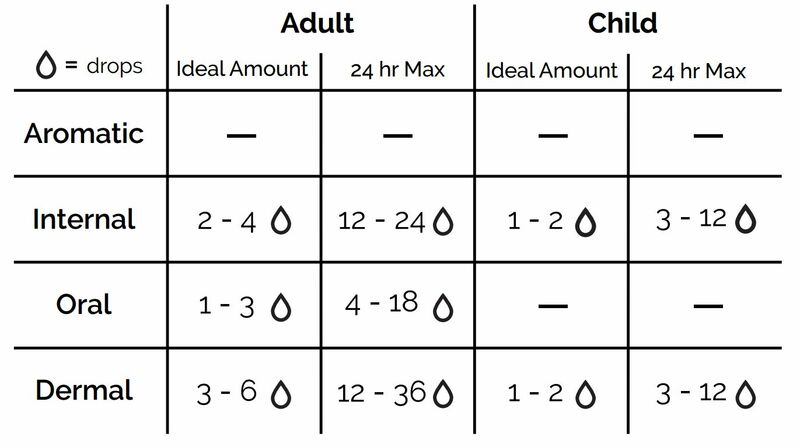 Find out more about dilution ratios and carrier oils. Age. Young children and the elderly or anyone who knows they have sensitive skin, will require special precautions when using essential oils. Their skin is typically more delicate and sensitive; in these cases, appropriate dilution modifications or essential oil substitutions for less strong oils (like Spearmint instead of Peppermint) can be made. The way I incorporate oils in my daily life (and I'm probably going to forget some ideas... and this routine changes all the time, but here's a bit of a typical day for me. often before combing my hair, I will put a drop or two of Cypress in my hand, rub my palms together, and run my hands th rough my hair! It's a great detangler too and I love the smell! I wash my face with the Veráge Cleanser, followed by the Veráge Toner, and Veráge Moisturiser. I love the Verage Kit! I will also, from time to time, make my own versions of the Serum and Toner when I run out of some of the items and my kit hasn't arrived yet. These days, because I'm on a bit of a special food protocol, I use 2 drops of Zendocrine and 2 drops of Lemon in a vegie capsule. I like to diffuse On Guard in my office, specially during Winter. At dinner time, for the same reasons as above: 2 drops of Zendocrine and 2 drops of Lemon in a vegie capsule. a few dabs of Immortelle (aka as Salubelle) around (but not near) the eye area and cheeks, forehead and chin. and a sleep inducing blend in the diffuser, usually incorporating Vetiver or Serenity (aka Lavender Peace) but I do mix it up. I have a sleep blend every Saturday on my Instagram and Facebook page, so I'm never out of inspiration. So without even trying that's a whole lot of different oils used in one day! If you would like to purchase some oils, please see this page HERE purchasing through my link mydoterra.com/fstewart ensures that you will be placed under my care and will receive my full support. I'm able also to offer you a consultation prior to your first order to figure out what the best oils are for your needs and which would be the most intelligent way for you to start your journey. You can find me on Facebook, Instagram, or contact me via the home page of this site.